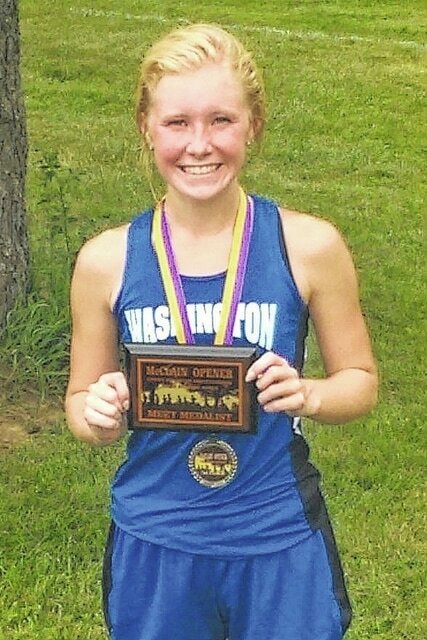 Washington’s Maddy Garrison holds the plaque she received after winning the McClain season-opening meet held at Mitchell Park in Greenfield Wednesday, Aug. 24, 2016. 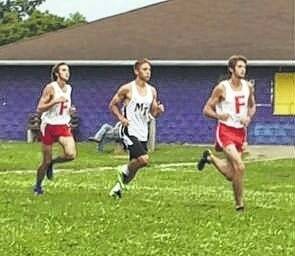 Blake Pittser of Miami Trace, is flanked by runners from Fairfield High School during the season-opening meet hosted by McClain High School and held at Mitchell Park in Greenfield Wednesday, Aug. 24, 2016. Pittser placed second out of a field of 76 competitors. Maddy Garrison of Washington (at left), and several Miami Trace runners are pictured at the start of the McClain season-opening cross country race at Mitchell Park in Greenfield Wednesday, Aug. 24, 2016. Garrison won the race in a time of 19:39.7. 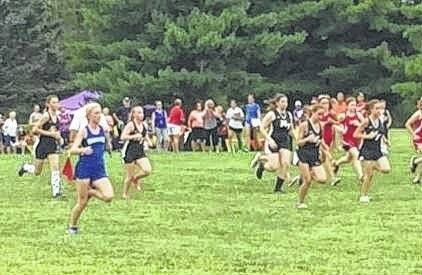 GREENFIELD — The Washington Blue Lion and Miami Trace Panther cross country teams competed in a season-opening meet hosted by the McClain Tigers at Mitchell Park in Greenfield Wednesday, Aug. 24. Also competing were Hillsboro, Chillicothe, Fairfield and Whiteoak. In the high school girls race, Washington’s Maddy Garrison won in a time of 19:39.7. She was the only runner out of 47 to complete the course in under 20 minutes. Lakin Tarlton of Chillicothe was second in 20:04.0. In the boys high school race, Blake Pittser of Miami Trace placed second out of 76 runners with a time of 17:07.18. Noah Richmond of Fairfield won the event in a time of 16:46.44. Fairfield won the boys team event with 19 placement points. Miami Trace placed second with 68 points, followed by Hillsboro with 98, Chillicothe with 123, Whiteoak with 131 and Washington with 142. McClain did not have enough runners to tally a team score. Chillicothe won the girls high school team event with 24 points, followed by Fairfield with 55, Whiteoak with 87, Washington with 90 points and Miami Trace with 200 points. McClain and Hillsboro did not have enough girls to post a team score. On the boys’ side, Fairfield had six of the top seven runners. Josh Trimmer was the first Blue Lion to cross the finish line, placing 13th in 18:48.91. Also for Miami Trace: Henry DeBruin was 11th in 18:39.91; Simon DeBruin placed 12th in 18:44.15; Nick Foody was 21st in 20:00.38; Jake Atwood placed 22nd in 20:05.06; Cole Enochs was 25th with a time of 20:46.94; Kody Burns placed 26th in 20:47.28; Caleb Perry was 30th in 21:02.81; Wyatt Cory was 31st in 21:07.12; Todd Peterson placed 35th in 21:18.38; Skylar Brannonn-Lyons was 53rd in 23:58.34; Matthew Warner was 54th in 24:09.94; Coby Seyfang was 74th in 29:24.22. Also for the Blue Lions: Connor Lane was 16th in 19:26.00; James Baughn placed 36th in 21:23.12; Cody Riley was 38th in 21:52.50; Collin George placed 39th in 22:00.53; Brandon Underwood was 42nd in 22:20.69; Kalub Wilkerson was 46th in 23:08.44; Levi Clay was 47th in 23:10.02; Ethan Stewart placed 48th in 23:11.31; Connor Frederick was 49th in 23:12.93; Frederick Geller was 56th in 24:27.62; Christian Grove was 69th in 27:25.78; Robert Crabtree placed 72nd in 29:13.78; Keiya Satoh was 73rd in 29:14.84. Ricky Villarreal of Chillicothe was the first member of his team to finish, taking eighth place in 18:12.09. Micah Pinney led Hillsboro, placing 10th in 18:34.97. Atlee Carr of Whiteoak paced the Wildcats, taking 18th place in 19:34.46. Saylor Preston was the first Miami Trace girl to complete the race. She finished 32nd in 28:01.8. McKenzie Grafstrom was 36th in 29:57.7. Rayana Burns was second for Washington, 9th overall in 23:33.3. Also for Washington: Alexa Harris, 16th, 25:53.2; Alexandra Funari, 19th, 26.11.2; Tahja Pettiford, 21st, 26:34.9; Catelyn Colter, 24th, 27:15.7; Megan Rohrer, 28th, 27:44.0; Haley Copas, 30th, 27:53.0; Mallory Whitworth, 33rd, 28:20.3; Bianca Rogers-Wright, 46th, 37:56.8. Also for Miami Trace: Mackenzie Munro, 42nd, 34:12.7; Kiley Munro, 43rd, 34:54.1; Gretchen Ivers, 47th, 37:57.1. Ciara Colwell of Fairfield was third in 20;56.7. Caitlin Ahrmann was the first runner to finish for Hillsboro, placing eighth in 23:14.5. Taylor Tackett of Whiteoak was 12th in 24:15.7. Natalie Cunningham of McClain was her team’s top placer, coming in 29th in 27:47.9. Fairfield won the middle school boys race with 29 placement points. Chillicothe was second with 93 points, followed by Miami Trace with 115 points, Whiteoak with 121 and Washington with 233. Greenfield and Hillsboro did not have enough runners to post a team score. Cohen Frost won the boys race for Fairfield in a time of 11:32.7. Bo Little of Miami Trace was fourth in 12:11.9 and Weston Melvin was fifth in 12:12.7. Branton Dawes was the top runner for Washington, placing 21st in 13.53.8. Gabriel Pickerill was 41st in 16:14.9. Also for Miami Trace: Connor Bucher, 24th, 14:13.3; Jadon Rowe, 33rd, 15:04.7; Kaiden Thompson, 49th, 17:57.5. Also for Washington: Ethan Rogers-Wright, 53rd, 19:48.1; Luke Rader, 57th, 21:00.1; Caden Hott, 61st, 23:13.5. Fairfield won the girls middle school race with 33 placement points. Whiteoak was second with 58 and Washington was third with 74. The winner of the race was Raelynn Ruble of Whiteoak in 12:58.8. Cole Copas of Washington was fourth in 14:50.1; Alexa Perez was 13th in 17:10.0. The first finisher for Miami Trace was Kirsten Lucas, 14th in 17:14.7. Carmen Enochs was 18th in 18:29.3. Also for Washington: Larissa Burgren, 25th, 24:09.4; Shelbee Crago, 26th, 24:23.4. Also for Miami Trace: Kandice Matthews, 23rd, 20:34.2; Lorelei King, 24th, 20:44.0. Evan Siberall was the top boy for Chillicothe, placing second in 11:54.0. Jonathan Hatfield led Hillsboro in seventh with a time of 12:23.9. Nick Bailey led Whiteoak placing 14th in 13:32.7. Nathan Ernst of Greenfield was 18th in 13:35.5. On the girls’ side, Magarah Bloom of Fairfield was 2nd in 12:59.9. Ann Ames of Whiteoak was fifth in 15:14.3. Emma Ahrmann of Hillsboro led her team, placing eight in 15:35.3. Shayna Beatty of Greenfield was 21st in 19:14.6.